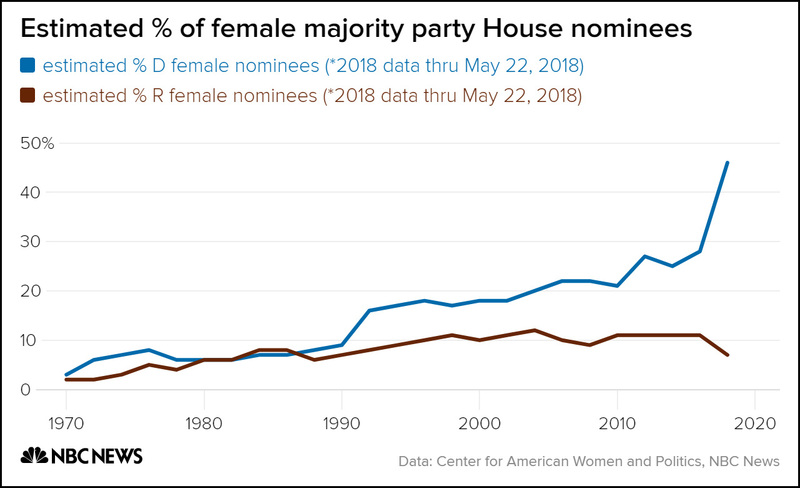 The two parties were pretty even until 1990, when Democrats started a steady rise in the number of women who ran for a seat in Congress. This opened up a wide gap against Republicans. Then came Donald Trump and women responded in huge numbers. The number of women running for office skyrocketed, nearly reaching parity with men. Meanwhile, Republicans saw a noticeable decrease in the number of women. The gender gap between Democrats and Republicans has always been around, but if this chart is telling us anything, it got way bigger when the groper-in-chief took up residence in the Oval Office. That’s not really surprising, but the size of the Democratic response is. Republicans have now lost not just nonwhites, and not just the young, but women as well. All they’ve got left are white men over 30. They’re managing to do pretty well with them so far, but how long can they keep it up?